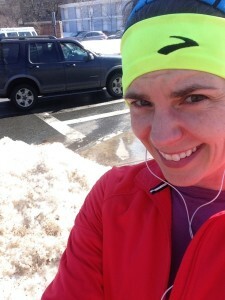 Boston Marathon Training Week 13: Superstition | Amy Bucher, Ph.D.
It’s a good thing I’m not superstitious, because the 13th week of Boston Marathon training included a Friday the 13th. I also unthinkingly wore my shirt from the cancelled Black Cat 20 miler race on one of my midweek runs; cancelled race AND a black cat? Am I asking for bad luck? Don’t worry, I avoided the ultimate bad juju behavior of wearing my Boston Marathon Celebration jacket before finishing the race. 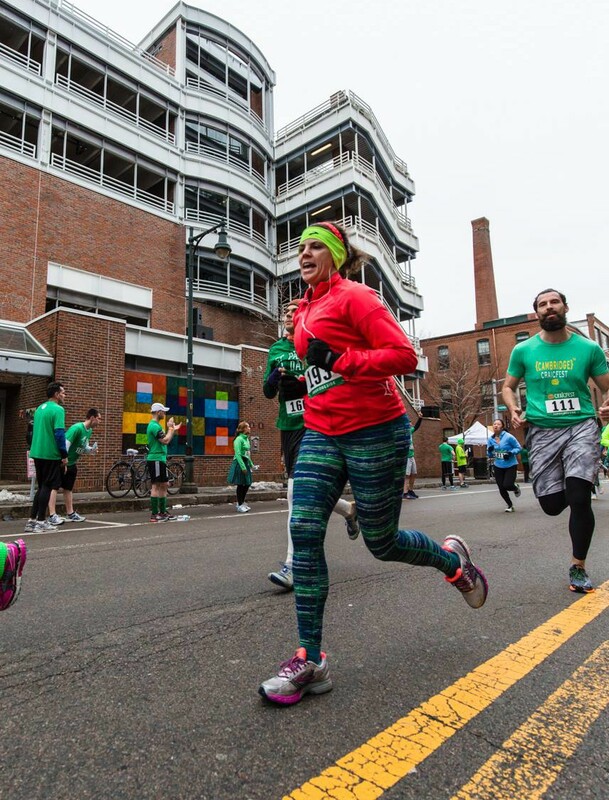 One exciting development this week: The BAA released runners’ race numbers and corral placements! 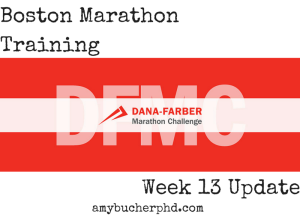 The Dana-Farber Marathon Challenge team members all have numbers together and the general consensus is that we all love having numbers that start with “26.” The marathon is of course 26.2 miles, and it is also the 26th year that DFMC has fielded a marathon team, so the numbers are fitting. 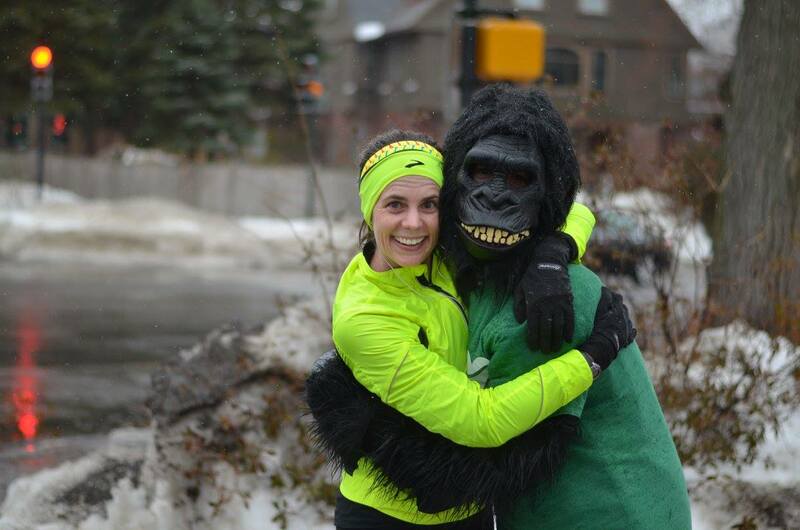 I’ll be in the last group of runners to leave Hopkinton on race day, with a marathon start time around 11:15 a.m. It did not escape my notice that my race number also has a “13” in it. Snowy Boston as seen on a river run. I’m doing great on the long runs, having been pretty faithful to the DFMC Intermediate plan’s recommendations. I’ve completed one 20 miler and plan to do a second for my last long run before the taper. Can’t wait to make this right on Marathon Monday! Mid-week runs is where I’m “behind.” I should be doing three of these per week and I generally am, but my distances are shorter than my plans recommend. DFMC sometimes wants me to run 10-12 miles during the week, and that’s just not realistic for me. It’s a combination of the time it takes to run that long and the fact that to fit in a 12 mile run on a workday, it would have to be after work, which means after sundown, which means I can’t run my normal routes on the river. I haven’t done any speed workouts. I knew this would be hard for me, because I do not like speed workouts. I successfully ran LA without doing speed workouts and I do have treadmill access for another two weeks, so all is not lost yet. So it’s not like I’m not working out, but I have been beating myself up a little for not adhering to the letter of the plan. Maybe too sunny–I couldn’t see enough to get an attractive background in my selfie. 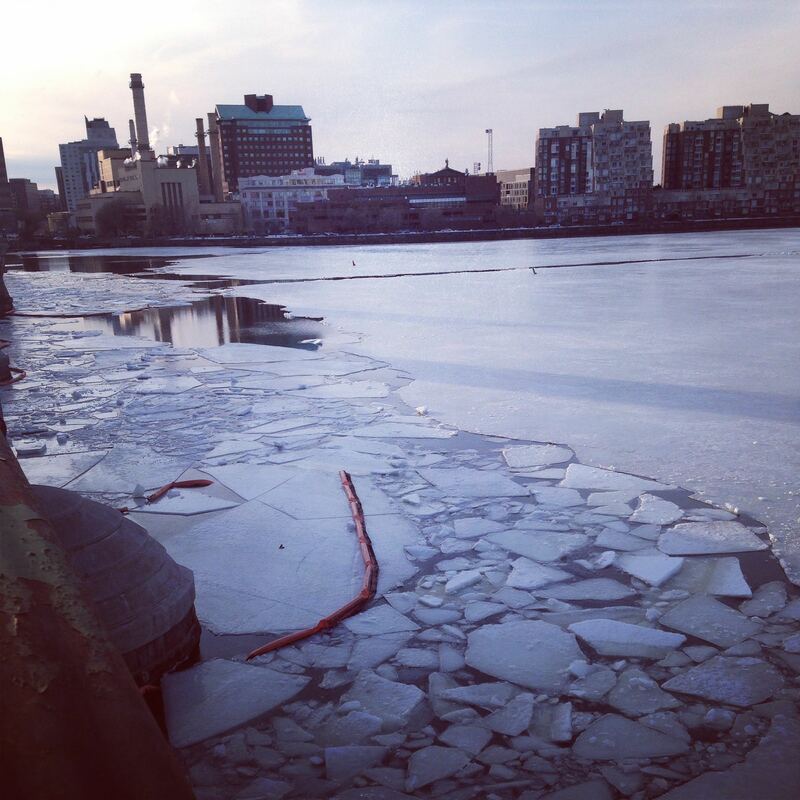 On Monday, I ran 5 easy miles along the river. I ended up changing my route a bit on the fly because of the enormous mess I found on the river path. 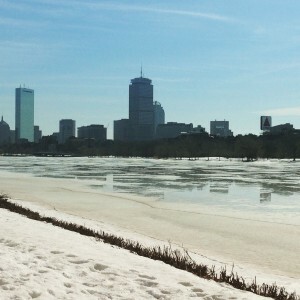 The snow is finally beginning to melt (yay!) 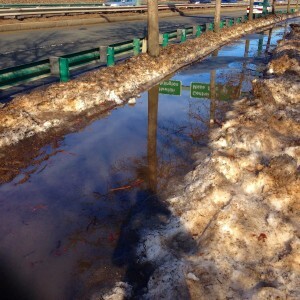 but this means lots of slush, puddles, and ice. Aside from the wet and slippery ground conditions, I really enjoyed running in the sunshine without Arctic winds on my face! Of note: Monday was the day after my 20 mile long run, so I wasn’t sure about trying for 5 miles. I found that my legs actually felt better during my run and immediately after as the exercise relieved some stiffness and pain. By Monday evening, my legs were pretty sore again, but I believe it was overall the right choice to run. On Wednesday I decided to go for the gusto and run 8.3 miles (as recommended by both of my training plans). The ground was better than Monday, albeit still very slushy and wet. I have to say, the plowing on the Cambridge side of the river was crazy. 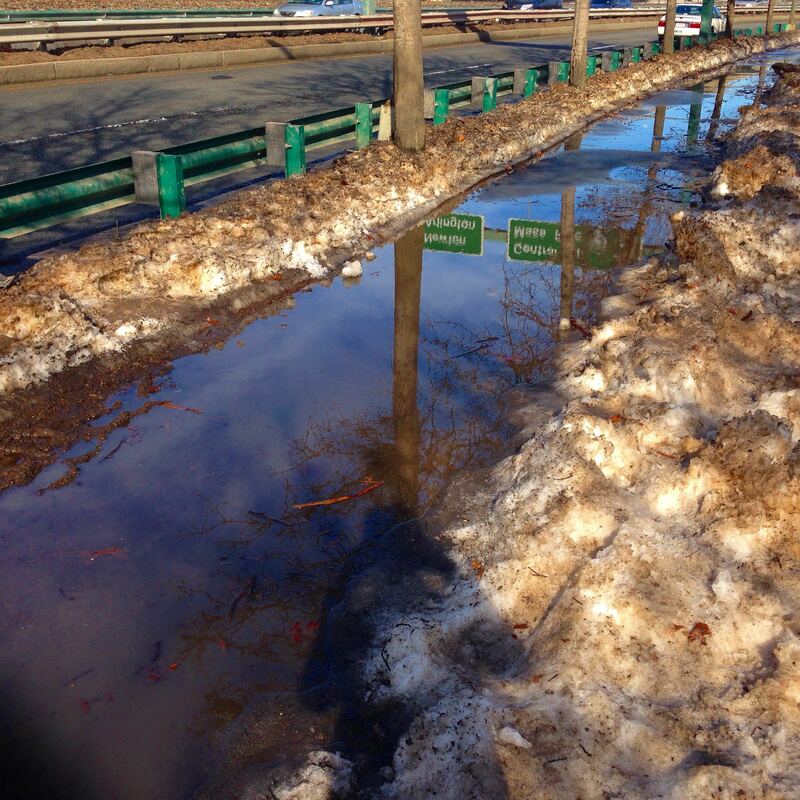 Sometimes the sidewalk would be clear, but sometimes it would either be a lake or there’d be only a narrow little strip clear. There was one section maybe .25 miles long where they plowed a sidewalk-wide section of grass while leaving the snow intact on the path. So, my sneakers are basically black now from tramping through mud. Despite the ick, this was also a nice run. The change in weather makes an enormous difference. Only two midweek runs! See why I’m so anxious?!?! I took this photo on a walk, which is a sort of cross-training, right? Not too much to say here except that I did some cross-training! I took a PowerBurn class on Tuesday, went to vinyasa yoga on Wednesday, and took a Flywheel spin class on Friday. I experienced neither disaster nor triumph. On the bright side, at least the temperature had double digits. 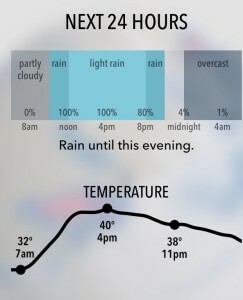 The week leading into Saturday was very exciting because the weather forecast predicted a 100% chance of rain. Some weather outlets even said “freezing rain.” This was both a disappointing forecast and an interesting change from Arctic temperatures and blizzards. 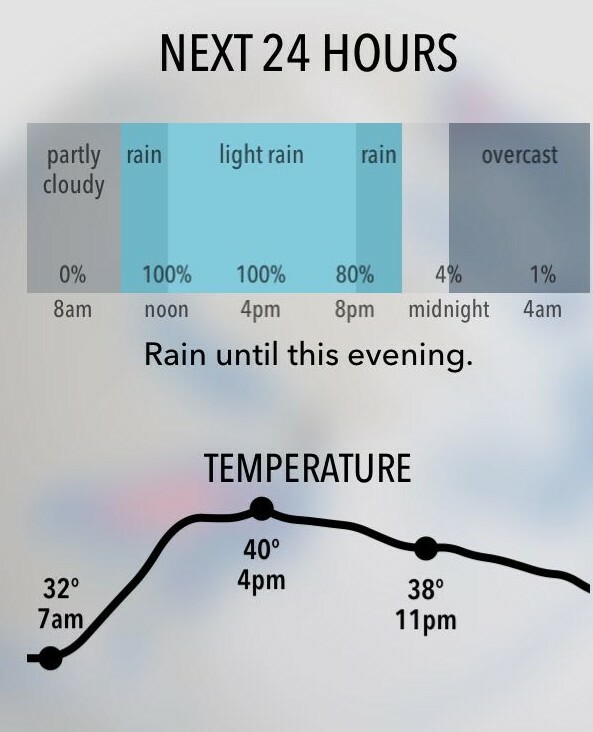 I finally accepted that it was going to be a rainy weekend, but continued to hope was that the rain would at least hold off until after our run. The first drops splattered onto our windshield as we drove out to Wellesley to meet the team. Oh well. 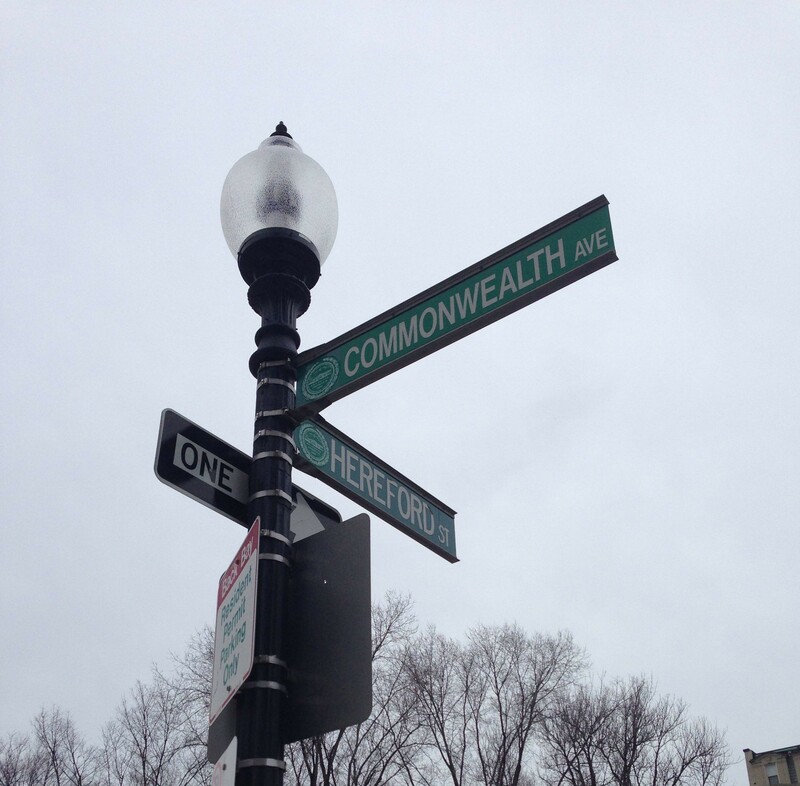 The run was 16 hilly miles along the marathon course from Wellesley into Newton, stopping at the foot of Heartbreak Hill before turning around. While this meant we didn’t have to run up Heartbreak this week, it also meant we had to ascend one of the steepest downhills on the course to return to our starting point. My deep thoughts on the run’s elevation profile. We ran down this hill in our very first group training run a few months ago, and although I was tired and wouldn’t call this run strong, I noticed I was much more capable on the hill today than a few months ago. I didn’t have to stop at all. I was psyched to see progress! Heartbreak Bill, a bit of sunshine in the storm. In the bad luck vein, my Runkeeper app didn’t record my run and my watch bid the mortal earth adieu after being soaked in my sleeve for hours, so I don’t have my data on how long this run took. Start line and graffiti decor at the post-race party. 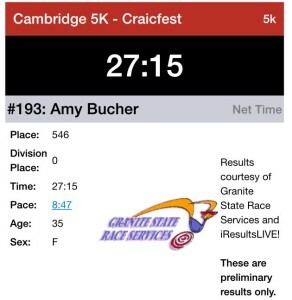 On Sunday my husband and I ran the Cambridge 5k Craicfest race. I figured that I could run an easy pace and use it as one of my midweek runs (plus I’ve found a gentle run the day after a long one eases some of my muscle soreness). I’ve run this race a couple times in the past and it’s always a good time. Oh dear Lord. 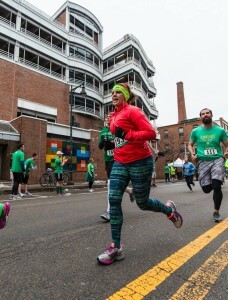 Possibly the least flattering camera angle ever in a running shot. Me thundering toward the finish. 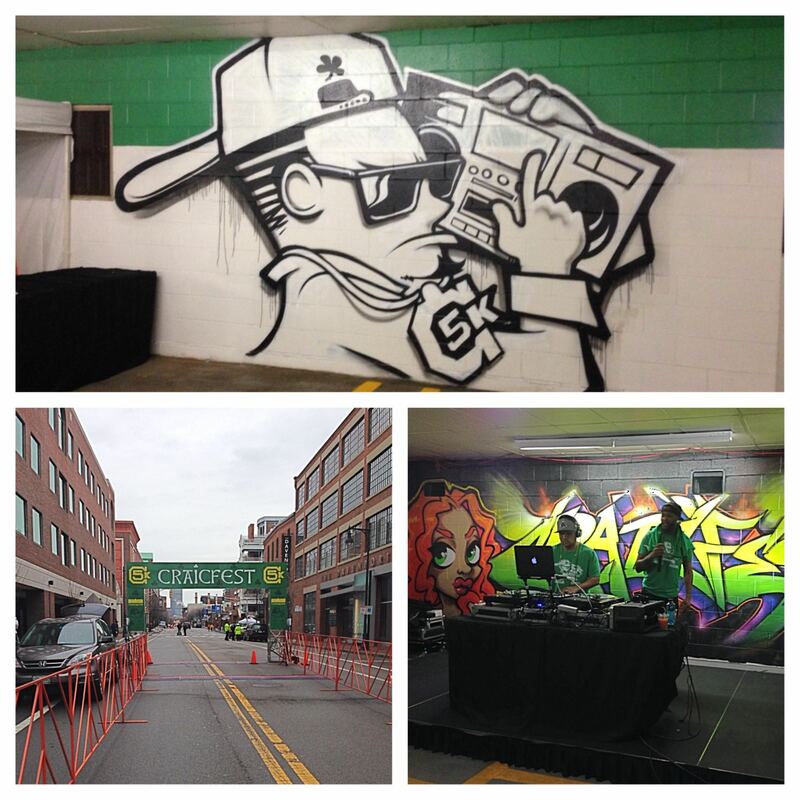 One improvement this year was moving the after-party from an outdoor space into an unused part of the Cambridgeside Galleria parking garage, which was appropriately graffitied with race-relevant images. Moving the party indoors meant I wasn’t immediately shivering and eager to get home. I usually run on Team Notch (hooray Team Notch!) 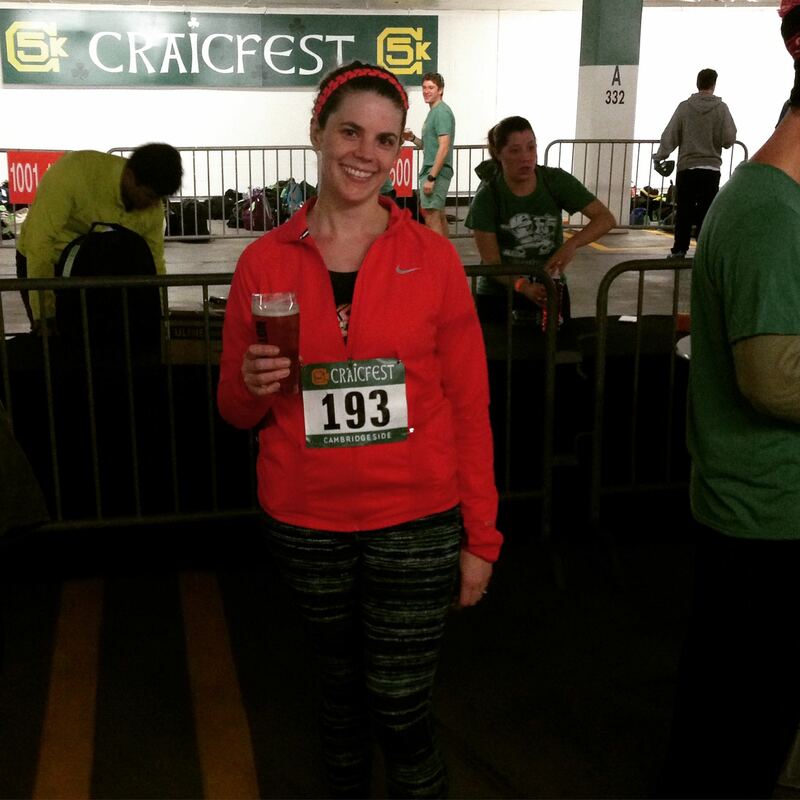 and loved being able to hang out with my new Notch pint glass full of delicious Left of the Dial beer post-race. Me and my Notch beer. 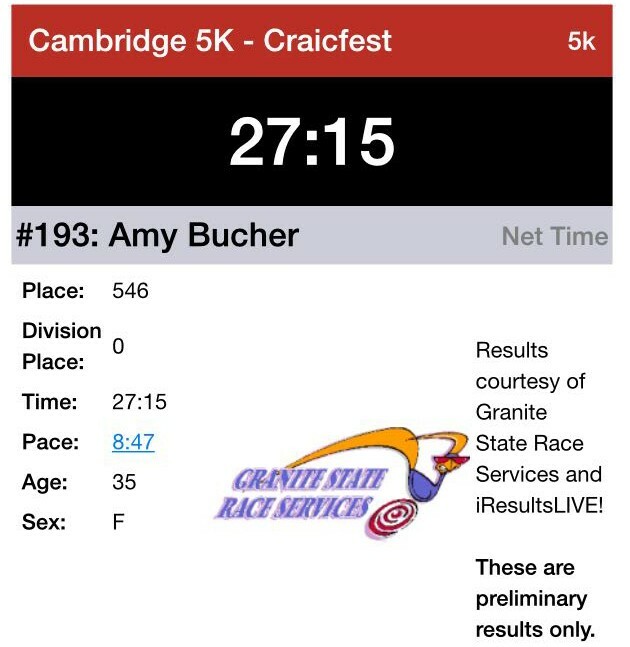 Since my watch died on my long run the day before, I ran this race without a timepiece. I felt really naked without it; I hadn’t realized how often during a race I check my watch to track my progress. I figured I’d end up with a slower time than usual due to tired legs, but was thrilled to learn that I crossed the finish line at 27:15, which is a decent time for me. 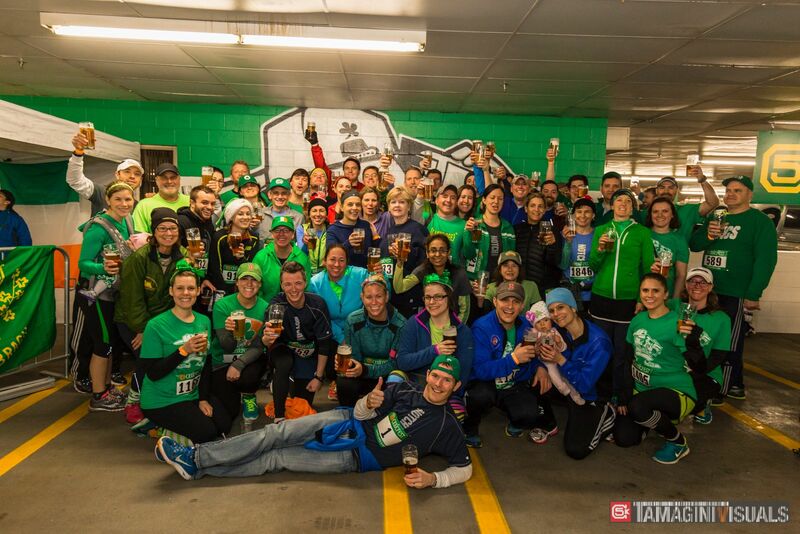 Team Notch–I’m in the pink jacket with my head partially obscured, near the center one row ahead of the last one. I probably should have moved forward a bit. I am a whopping 95% of the way there to my $12,750 goal. Wow! Thank you all for your incredible generosity! This money will be entirely spent on innovative cancer research that may lead to improvements in cancer diagnosis, treatment, and cure. As excited as I am about nearing that big $12,750 goal, how cool would it be to make it $13,100? That would mean every mile I run on April 20 would mean $500 for the Dana-Farber Cancer Institute. I hope you’ll consider donating to help achieve this goal. 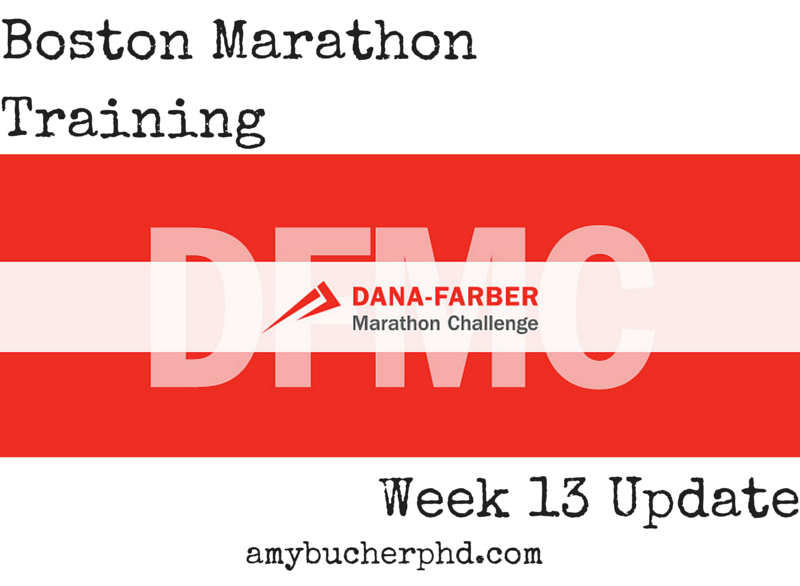 You can donate to my run any time at my personal Dana-Farber Marathon Challenge page, rundfmc.org/2015/amybucher. If you’re not into electronic donation, I also have mailing envelopes and receipts I can provide if you prefer to pay by check (made out to Dana-Farber Cancer Institute) or cash. Just let me know. I’m hoping to have an item for an opportunity drawing for people who donate between now and the end of March. I will update my blog with details when I sort that out.